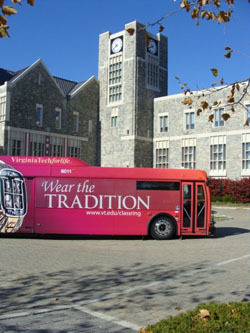 If you’ve spent any time in Blacksburg, you’ve certainly seen our buses. In fact, you’ve probably been stuck behind one that stops frequently to pick up and drop off customers. But you know what? They travel all over town. They’re BIG. And they’re NOTICEABLE. And, an ad on the rear or side of a 60’-long articulated bus won’t go unnoticed. So, hop on board with BT and start getting your ad noticed! We have options to fit every budget, whether you want to promote your local business to riders or see your logo driving through the center of town. Whatever your advertising needs, we’ll make sure you get noticed. Interior advertising is a great way to advertise your local business to a captive, student based audience. With more than 4 million people riding BT buses each year your ads will certainly be noticed. Prices are $400 per month with a discount for annual contracts. Think of it as a billboard on wheels, rolling around the streets of Blacksburg. Operating seven days a week and traveling over 1 million miles a year our buses are seen daily by thousands of people. With rates starting at $210 per month and a variety of sizes, we have options to meet every budget. Want to maximize your exposure? Consider multiple ads, one of our supersized articulated bus ads, or even a fully wrapped bus. Production costs are the advertiser’s responsibility and can only be completed by vendor's that use recommended materials and guarantee both the product and lack of damage to BT vehicles. Production costs are the advertiser's responsibility, please contact BT for additional information. Costs may vary based on the ad size and complexity of the installation. Clings cannot be re-used; once they have been removed from a vehicle they cannot be re-applied. Which ad size and location would you like? Contact your designer and think about what you’d like on the ad. Remember, keep it simple with a minimal amount of text! Please review our Advertising policy and Frequently Asked Questions for more information.